You'd never know that this quiet, quaint community was in the heart of a major U.S. city that was once known as the murder capital of the U.S. Find out just what its secret is. "It's all about neighbors looking out for one another. It's as simple as that," says Gloria Logan. And she should know. Over twenty-five years ago, she and her husband Dennis founded one of the most successful Neighborhood Watch programs in the country, and it's still going strong today. Located in the heart of Washington, DC - a city that is certainly no stranger to violence and crime - the Logans' neighborhood is quiet, beautiful, and perhaps most important, safe as a result of residents' commitment to their community and to each other. In 1980, Dennis Logan, then Deputy Chief of the Metropolitan Fire Department, retired from his professional career, but he was far from ready to stop serving his community. When a colleague suggested he start a Neighborhood Watch, he didn't so much as hesitate. Instead, with the help of his wife Gloria, Mr. Logan immediately got to work. The very first meeting of the Hillcrest Neighborhood Watch was attended by thirty people. According to the Logans, the group's continued success is a credit to the willingness of their fellow neighbors to become involved. "We started the NW group, that's true, but it took the community to get interested and join in to make it successful," says Mrs. Logan. And join in they did. Interest in the NW continued to escalate and more and more residents throughout the neighborhood began becoming involved. In fact, over the years, the Hillcrest NW grew to several hundred participants, with 200 block captains and zone leaders. One of the most popular events that the NW began celebrating is National Night Out. It held its first on the front lawn of the Logans' SE Washington home in 1989. "We wanted to do something more than just turn on our lights and stand outside by our front door to support National Night Out; we wanted the community to get involved, so we put together some flyers and invited neighbors to meet in our front yard," recalls Mrs. Logan. That first year, neighbors from around the community crammed into the Logans' yard, threw some hot dogs on the grill, and enjoyed neighborly conversation. By the next year, the crowd had grown so large that their front yard had become far too small to accommodate everyone, so the Logans enlisted the help of their next door neighbors, who agreed to allow them to use their front yard, as well. Soon after, the gathering of NW participants outgrew this space, and the pastor at the local Lutheran Church offered the use of his parking lot to hold the event. Year after year, more and more people attended the event, and year after year, the event required a larger space. "National Night Out has been a great success for our NW, and has not involved simply our group, but others around the area, as well," says Mrs. Logan, who says her husband began including presidents from a number of NWs around the area. Though they still participate in meetings and events, Mr. Logan, now in his eighties, and Mrs. Logan, who is in her seventies, have stepped back from their NW responsibilities, but the communication network they established hasn't missed a beat. In fact, one of the primary reasons behind the community's continued involvement over the years is the fact that it has been organized and has been connected with each other as well as law enforcement. Of the most important tools the community has relied on for communication purposes is a book created by Mr. Logan that is broken down into various zones, and includes names, addresses, phone numbers, and the houses for which each block captain is responsible. "The book is an incredible resource and is very well organized," says Yvonne Smith, who works in the Office of Assistant Chief of the Metropolitan Police Department Willie Dandridge and works directly with the Hillcrest NW to coordinate print and online communication. "We're going to continue using the book, but we're going to update to it a bit by adding email addresses and cell phone numbers, neither of which were around when Mr. Logan created the book." Smith says she also plans to add color photos to the book, as well. In addition to the book, Smith has also created a NW listserve that is used for the police and the community to communicate with each other. It was via the listserv that Smith became aware of a problem in the community that required attention. A construction company had accidentally cut a phone line and a number of residents were left without phone service. Since the community contains a high population of elderly residents, this was a potentially dangerous situation. As a result, Smith, in conjunction with DCPD Inspector Alton Bigelow, arranged to have special cell phones distributed to the community so they would at the very least able to dial 911 in the event of an emergency. The police department also beefed up police presence throughout nighttime hours during the phone outage for added safety. Residents praised the department for this effort and staying attentive to the needs of the community. "If a particular crime happens, we let residents know via the listserv," says Bigelow, who says that residents contact him if they see an incident that they want to know more about. "Residents will call me or use the listserv to ask about something that's taken place. If they should notice increased police presence on a corner in the neighborhood, for instance, they will contact me and ask what happened." Bigelow says residents have his cell phone number so that they can easily communicate with him, and it's this open flow of communication that keeps their relationship so strong. Another example of communication at its finest occurred following an event that recently took place in the community. A supposed roof contractor made his way through the neighborhood, going door to door trying to convince residents they needed to have their roofs replaced. One resident was fooled by the con artist and gave the man a check for services. When the man never showed up to do the work and she realized that he was not legitimate, she communicated with Smith and word about the situation quickly spread throughout the community to prevent others from falling victim to the scam. "Communication is one of the elements that have made the Hillcrest NW so successful," says Smith, who says in addition to staying connected via the listserv, the group also meets monthly, along with designated law enforcement, to discuss issues relevant to the community. Inspector Bigelow, who, in the absence of the Logans' direct guidance, was recently assigned to coordinate the community's NW efforts, meet with block captains, and keep the community informed, says community involvement has been critical to the NW's accomplishments. "Mr. Logan was able to galvanize the community and help residents become committed to working together," says Bigelow. "That was very important because it really takes a whole community effort - not just police presence - to keep communities safe. It's all about partnership." In the Hillcrest community, it's not just about commitment; it's also about a strong resolve. According to Smith, when they want something to change, they take it upon themselves to get the job done. "If the residents want to change a two-way street to one-way street for safety reasons, they know just what officials they need to contact, and they do it," says Smith. "They have dealt with officials from DC government agencies and the Mayor's office, they know how these agencies operate, and they don't hesitate to contact exactly who they need to - and even strongly urge a specific official to attend one of their meetings - to see to it that the needs of the community are met." As a result, says Smith, the neighborhood is neat and clean and is a deterrent to criminals. Before working with the Hillcrest community, Smith was dealing with a community rife with vacant properties, abandoned cars, drug issues, and crime. She immediately noticed that Hillcrest did not have these types of issues in their community, and she soon discovered it was for one reason and one reason only: They have refused to tolerate it. "If a potential issue arises that would disrupt their quality of life, the people of Hillcrest take care of it right away," says Smith. For example, last year, residents became very concerned when bright yellow signs that said "We buy ugly houses" began popping up throughout their neighborhood. They were not happy about it, and they were not about to take it sitting down. Not only did they remove the signs, they also recorded the license plate numbers of those who were putting them up. "Keeping up our neighborhood's appearance tells potential criminals this is not the place for them," says Mrs. Logan. Taking their efforts one step further, the group takes precautions to prevent crimes before they occur. 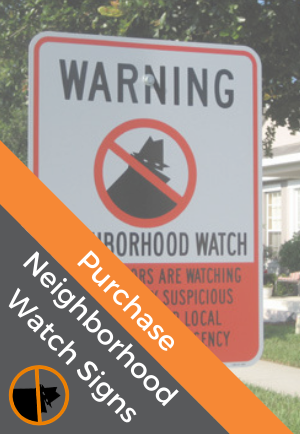 One example: "Watch Your Car" stickers can be seen on the cars of residents throughout the community. These stickers automatically give police permission to pull over cars containing them if they are seen being driven between 1:00 and 5:00 am, when most cars are stolen. "I once attended a meeting held by a block captain and noticed that the car of every attendee had the "Watch Your Car" sticker on its bumper," recalls Smith, who says many residents also use anti-theft devices, as well. "The community shares any new information about ways to secure their property, and they take necessary steps to make sure they do not become a crime statistic." "This group of individuals is extremely unique," says Lt. Ronald Netter, who is involved with coordinating the NW. "The community is very well-knit, very involved and concerned, and they have dedicated their time and energy to keeping their neighborhoods beautiful and safe." So committed are these residents, in fact, that Hillcrest NW is being considered as a model that will be used on a national level. And there's more to come. The community recently held a recruiting drive, in conjunction with their monthly meeting, and Lt. Netter says he is in the process of creating additional safety flyers and planning additional community events. "My goal is to make the Hillcrest NW the best in the nation," says Netter, who also heads up a senior citizen program in the community and is involved with a crime youth initiative, as well. Smith says they have begun focusing on emergency preparedness and terrorism awareness training, as well. The Chair of the Hillcrest Civic Association's Public Safety Committee, Anne Curtsinger, will begin offering emergency preparedness and terrorism awareness training to the group. The group will have the opportunity to participate in preparedness drills and mock emergency situations, and will receive literature containing information about terrorism awareness all in an effort to prepare residents in case of a major emergency. In the meantime, the Hillcrest NW will continue doing what it does best: staying connected with one another and making their neighborhood a safe, enjoyable place to live. "Just knowing, looking out for, and working with neighbors has generated amazing results, say the Logans. "If only neighborhoods around the world would do the same thing, we'd all live in a much better place."